"The time is just before the War of the Ring. The Shire is in grave danger. You are sitting in the Prancing Pony at Bree when a tall, hooded stranger motions for you to join him in the shadows at the rear of the inn. 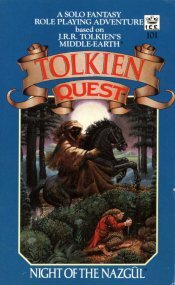 The man called Strider puts before you a dangerous but vital proposition: to warn the Hobbits of the Shire of the imminent arrival of the Black Riders, fierce evil spirits who threaten all good folk. Can you measure up to the task and cross the Brandywine to warn the Hobbits in time? A ROLE PLAYING ADVENTURE... WHERE YOU CONTROL YOUR DESTINY! • Compatible with other role-playing systems"
"Based on J.R.R. TOLKIEN'S THE LORD OF THE RINGS and THE HOBBIT. revered site known as Amon Sul, Orcs gather to attack travelers on the Great East Road. Within the peak lies a secret passage to the Deeps, great caverns beneath the earth guarded by fearsome denizens. In one cavern lies the legendary Staff of Truth, powerful relic of the Edain. A riddle leads you to search for the magic weapon, which promises great powers. Can you solve the riddle, find the Staff, and escape with your life? A COMPLETE ROLE PLAYING ADVENTURE... WHERE YOU CONTROL YOUR DESTINY! The Ring is destroyed and Sauron defeated, but deep within the dark forest of Mirkwood, danger lurks. Captured by Orcs, a son of Elvish nobility is held in chains, his days numbered. You have been asked by an Elvish princess to help her find her brother and free him. Legolas has offered his counsel, and Radagast might be persuaded to provide a guardian owl. The reward is great — but great enough to face Giant Spiders and a legion of Orcs? Only you can decide! A ROLE PLAYING ADVENTURE GAME... WHERE YOU CONTROL YOUR DESTINY! Saruman the White. But of late, you have grown troubled by what you see and hear within his mighty fortress of Isengard, Orcs and wild men gather inside. You have seen Saruman poised over the great seeing-stone exulting over scenes of battle. Has Saruman surrendered his will to the evil Sauron, Lord of the Rings? Can you warn the White Council before all is lost? 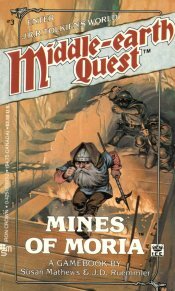 YOU control your destiny in this intriguing first gamebook of the MIDDLE-EARTH QUEST™ series!" "You are a young Warrior of Rohan. On the eve of battle, you witness a veteran Rider conferring with an arch-enemy. Is the Rider a traitor or a counter-spy passing false information to your foes? You resolve to find out and immediately plunge into adventures beyond your wildest imaginings. Before the tangled plot is resolved, you must do battle with Saruman's minions and defend the walls of the Hornburg at the climactic Battle of Helm's Deep! 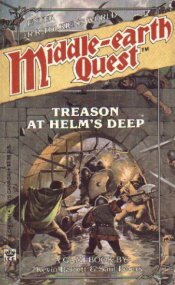 YOU control your destiny, and perhaps that of Helm's Deep, in this thrilling second gamebook of the MIDDLE-EARTH QUEST™ series! • Generate your own MIDDLE-EARTH ROLE PLAYING™ (MERP) character." "The War of the Ring is over, but the evils of the past linger. 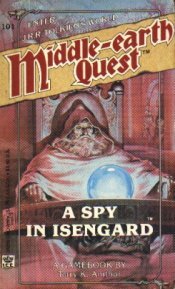 Bram, a Dwarf whose family hails from Moria, asks you to undertake a dangerous quest. In the long-abandoned caves of Moria lies a document which proves the family's claim to lands usurped by a wicked rival. Can you retrieve it? The family wishes to restore its dignity, honor, and wealth; any riches found along the way are yours. Word of this mission, however, has reached the Dwarf-usurper who threatens to kill anyone challenging his claim. Can you outwit his schemes, restore the family lands, and seize a fortune of your own? 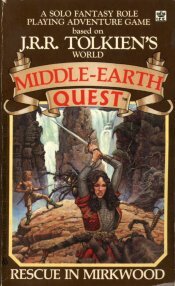 YOU control your destiny in this danger filled third gamebook of the MIDDLE-EARTH QUEST™ series!" "The Battle of Five Armies is long past, but the War of the Ring has yet to ravage Middle-earth. During this dark period of uneasiness, tension grows between the Free Peoples of Endor. When it comes to light that the last Seeing Stone of the North has been recovered, its power proves tempting. Now the Free Peoples race against each other and the minions of the Witch-king of Angmar to seize this great treasure for themselves. 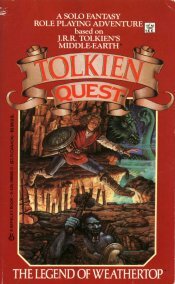 YOU are sent by Gandalf and Aragorn on an exciting and dangerous search in this, the fourth gamebook of the MIDDLE-EARTH QUEST(TM) series!"